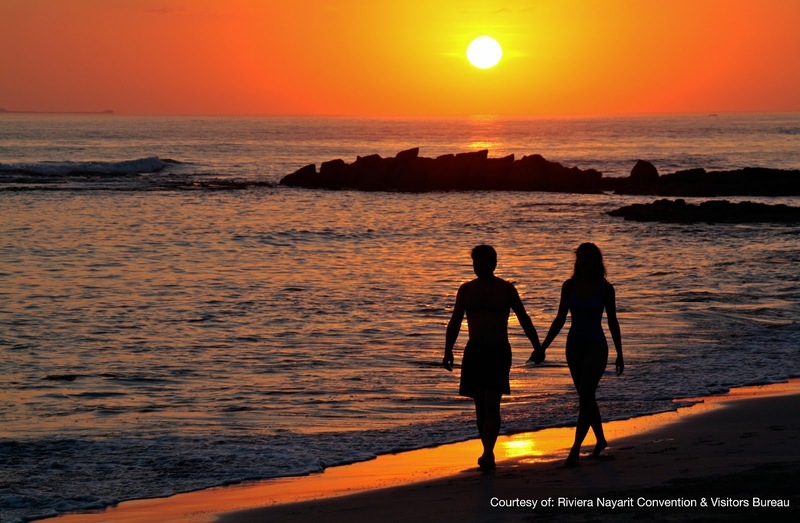 Picturesque fishing villages, nearly 200 miles of gorgeous beaches framed by the Sierra Madre Mountains and sunsets that will instantly become lifelong memories; Riviera Nayarit is a destination created for romance. Whether it’s rekindling love, increasing the flame, or beginning a new journey of the heart, Riviera Nayarit offers lovers many options to create the luxurious romantic getaway of their dreams. Embark on a private boat tour, enjoy a gourmet dinner right on the beach, or get lost in bliss together during a couple’s massage, it’s all possible with Riviera Nayarit’s romantic hotel packages. Grand Velas Riviera Nayarit redefines the all-inclusive resort by cultivating the highest standard of luxury. Offering the best in gourmet dining, world-class hospitality, a world-class spa and gorgeous accommodations in a spectacular setting, Grand Velas is the ideal romantic destination. Available for Valentine’s Day Weekend, the “Four-Night Romance Package” starts at $381 USD per person per night. Arrive to sparkling wine and relax with a $150 credit towards a 50-minute couple’s massage in the Spa. Top your experience off with breakfast in bed and a private four-course dinner on the beach from the resort’s gourmet chef. Hotel Cinco, located in Punta de Mita, is where chic meets an unpretentious, organic lifestyle. Here you will find stand-up paddle boarding, farm-to-table fare (or sea-to-table! ), and a refined atmosphere, at an intimate boutique inn with endless beaches and shady palm trees. Simply put: Hotel Cinco is a travel experience game changer and a premium romance destination. Opt to visit during Valentine’s Day weekend and take advantage of its “Romantic Package” available at a four-night minimum for just $1,400 USD. Start your romantic journey with an oceanfront suite with rose petals and champagne upon arrival and then take a private boat tour to exclusive sanctuary of the Marietas Islands. Couples won’t forget to relax when they take advantage of two 60-minute massages per person during their stay. Marival Residences & World Spa offers all-inclusive plans that encourage guests to “leave their worries at home.” Offering signature world spa treatments, Melange World Spa pampers their guests with a variety of spa techniques from many countries. At Marival, guests can combine whatever services they wish to make their stay as relaxing as possible. Take your loved one on Valentine’s Day Weekend and save 40 percent off your stay when you book before January 12, 2013. The hotel’s all-inclusive package includes VIP access to the beach club and a complimentary courtesy room for early arrivals and/or late check-outs. Couples can also take advantage of unlimited Golf Green Fees and unlimited / no reservations for at the resort’s specialty restaurants. St. Regis Punta Mita Resort is an intimate, exclusive beach resort. Immerse yourselves in luxury by taking advantage of three beachfront infinity pools and personalized butler service. Don’t forget to top it all off with a full menu of pampering and revitalizing treatments available at the 10,000 square-foot Remède Spa Punta Mita. The St. Regis is offering a seductive “SPA Romance Package” that includes roses upon arrival, an unforgettable Night Spa package for couples consisting of a 60-minute romantic couples’ massage at the inviting Luxury Spa Suite followed by an aphrodisiac menu created by the Five Diamond awarded chef Sylvain Desbois and personally presented to you by your own private waiter. This package starts at $742 USD per night for a Deluxe Room Garden View and $862 USD for a Deluxe Room Ocean View. Grand Palladium and The Royal Suites Punta de Mita are also spreading the love with their Valentine’s Day Special offering 25 percent off booking and 15 percent off their Spa using the online promotional code: LOVE2013PVR. Guests must book by February 13th to take advantage of this tropical haven, surrounded by lush vegetation on a private beach with almost 1000 feet of fine white sand. Bringing luxury to the all-inclusive, these Palladium resorts take pride in giving attention to even the smallest details and you can rest assured that the same attention will be paid to your romantic getaway. Mexico’s newest destination, Riviera Nayarit, stretches along 192 miles of pristine Pacific coast framed by the majestic Sierra Madre Mountains just ten minutes north of accessible Puerto Vallarta International Airport. The region extends along the entire coast of the Pacific state of Nayarit including the resorts of Nuevo Vallarta, the historic colonial town of San Blas, exclusive Punta Mita, picturesque fishing villages, miles of serene beaches and spectacular Banderas Bay. Riviera Nayarit offers countless activities, such as: PGA golf courses, luxury spas, whale watching, turtle release, zip lining, surfing, bird watching, international cuisine, and the local artwork from the traditional Huichol tribe. This year, as a testament to Riviera Nayarit’s luxury offerings, the destination garnered two impressive awards: the top spot for “Best Luxury Beach Destination in Mexico” from Travelocity’s Battle of the Destinations III and the “Best Destination Crystal Apple Award” by Apple Vacations. The region attracts and satisfies vacationers of all tastes and budgets with its wide range of accommodations including chic luxury resorts, eco-tourism boutique hotels and quaint B&B inns. For more information, visit www.RivieraNayarit.com or follow Riviera Nayarit's Fan Page on Facebook.